Whatever kind of bike you ride, whatever kind of riding you do, the chances are that you’re going to end up with some kind of leather jacket. 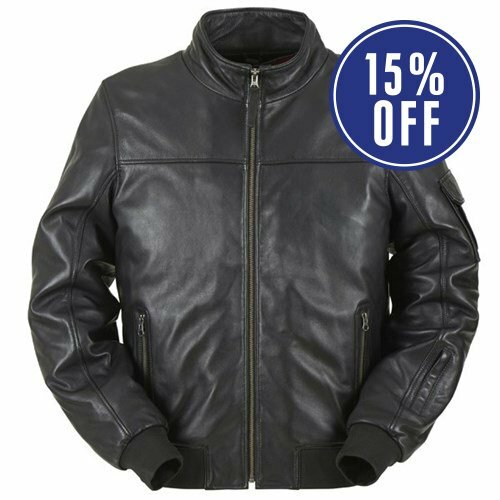 Leather may not always be the most practical solution, especially if you ride all year round, but there’s a law somewhere that says that every biker has to own at least one leather jacket. 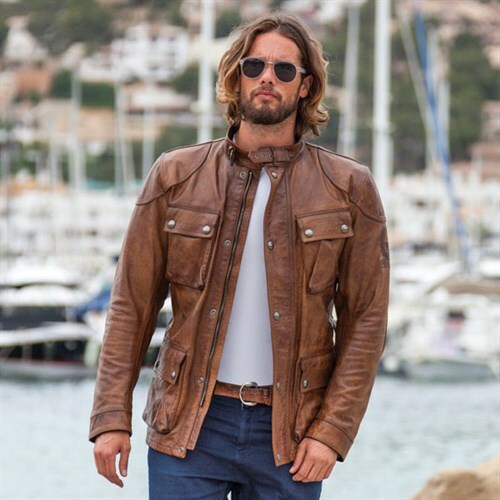 Well we think we’ve got some of the best and most stylish leather jackets on the market. And from the very best brands. 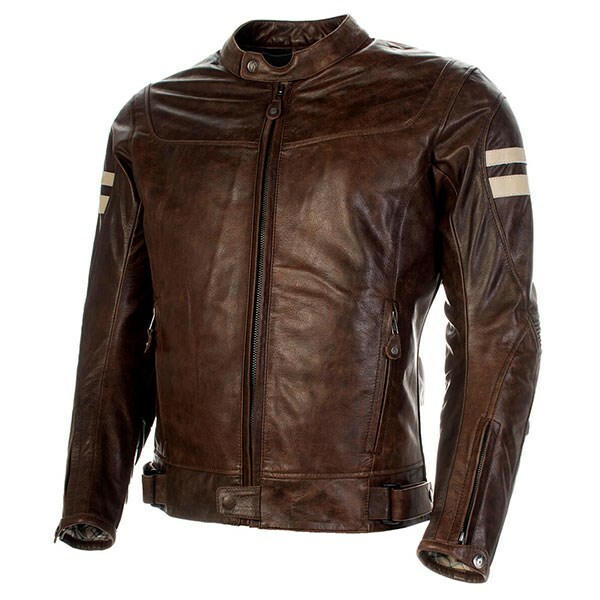 We’re talking about people like Belstaff, BKS, Furygan, Halvarssons, Helstons, Rokker, Roland Sands, Spidi and so on. In fact, we’ve got more than 140 different jackets on the website, so if there’s not one that’s got your name on it, we’d be surprised. 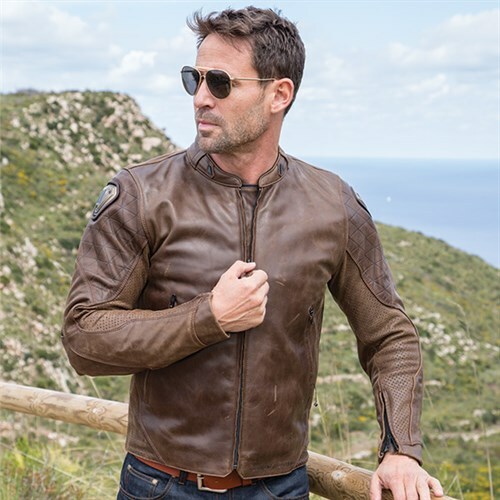 Of course, as with all motorcycle gear, there’s nothing that beats trying before you buy, so if you can find your way to Guildford, we’re pretty sure we can find just the right jacket for you. Here, we’ve listed just 10 of our favourites but, obviously, there’s a lot more where these came from. 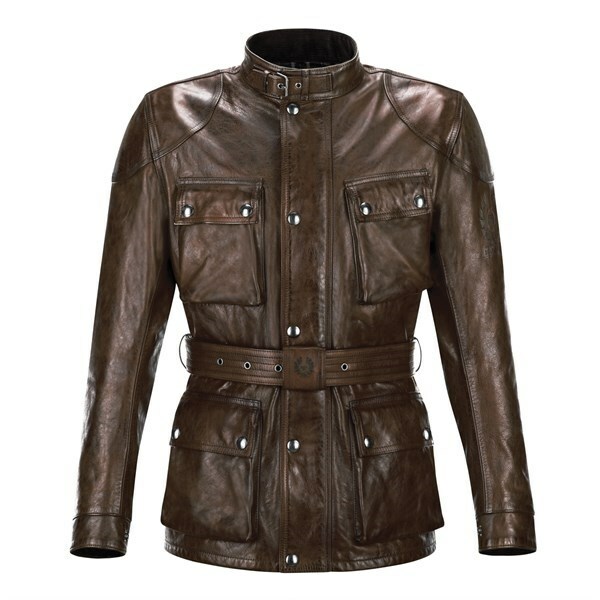 Helstons, in our view, makes some of the very best retro-styled, leather jackets on the market. Treated with a blend of oils and waxes, their leather is incredibly soft. Their jackets all come with a removable thermal inner, as well as all the necessary armour, including a back protector. And most of them, including the Jacket shown here, have a waterproof liner too. But it’s in the styling department that Helstons really excels. Perhaps the nicest jacket in the range, however, is this jacket, the Ace Vintage. It’s a jacket that it’s difficult not to look cool in! 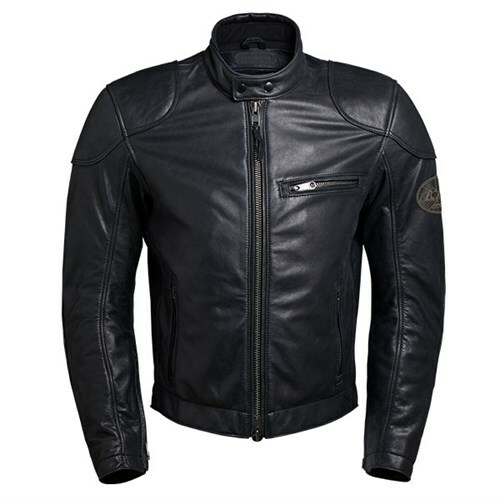 The Eagle is made from a beautiful goatskin that has been washed for an authentic patina. Goatskin is relatively thin, but incredibly strong for its thickness. It’s also amazingly soft and very easy to wear. 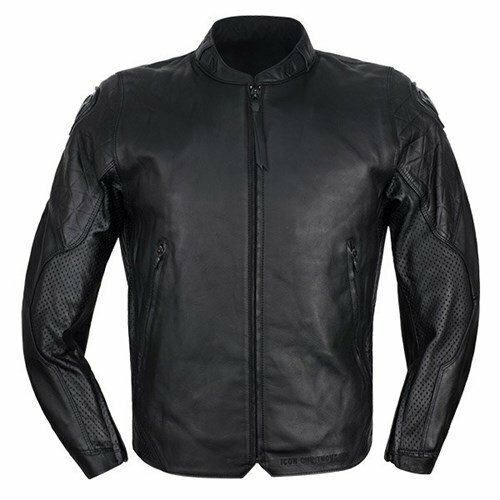 Because Halvarssons are naturally cautious when it comes to considerations of safety, the Eagle jacket is reinforced, in all the key areas of vulnerability, with their Hi-Art anti-abrasion lining that strengthens the leather by 200% (i.e: a factor for three!). There’s Level 2 CE armour in the elbows and shoulders, and a pocket for a back protector, although it doesn’t come as standard. We also like the traditional padded kidney panel and the waist adjusters. The jacket is quite short, but it has a zip that you can use if you‘re wearing it with one of Halvarssons’ leather pants. Use their very clever Waist Zip, and you can also zip the jacket into any pair of jeans. 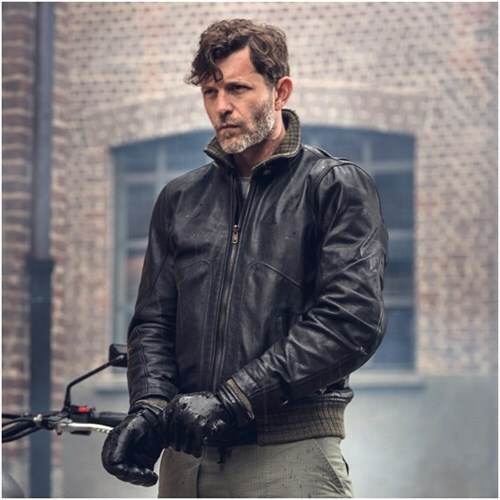 The Tank leather jacket is a beautifully designed and styled piece that apparently takes its inspiration from the jackets worn by the crews of military tanks in the last war. We can’t comment on that, but we love the cut, we love the knitted cuffs, hem and neck lining, and we love the suppleness of the leather. Spidi tell us that the leather is treated for waterproofing, but clearly you shouldn’t consider this to be a waterproof garment. Interestingly, it has an old-fashioned, felt gilet for warmth that’s really effective. Obviously, it comes with armour in the elbows and shoulders. There’s a pocket for a back protector. This might just be the coolest motorcycle jacket on the planet. 100% natural tanned leather, of between 1.1mm and 1.2mm in thickness. 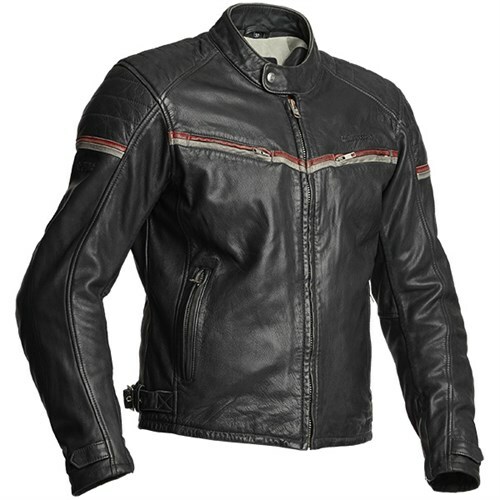 The jacket has suede panels up the sleeves, the zip runs two ways, and on the neck you get multiple snap adjusters. There are three pockets on the outside, and two on the inside. The jacket comes with D3O protectors in the elbows, shoulders and back. 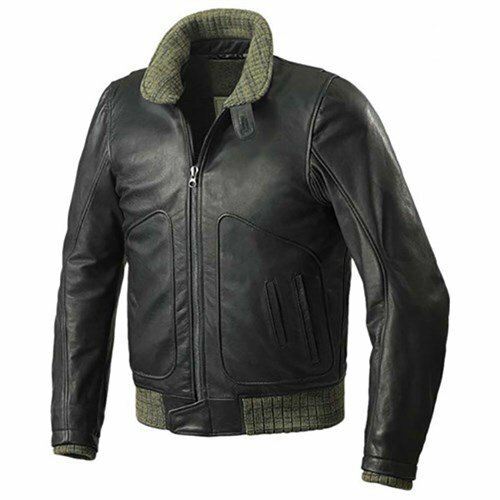 There’s no other jacket quite like the Café Racer. A lightweight it is not, but then again no leather jacket feels quite so reassuring to ride in. Now this jacket has basically sold out with Rokker. We took all their remaining stock they had because we love it so much. We’ve only got tiny quantities left, although some sizes have disappeared already. So you need to be quick. Bovine waxed leather 1.0/1.1mm. CE D3O protectors in shoulders and elbows. Pocket for back protector. Corduroy in collar and cuffs. Check lining. Four patch pockets with waterproof flaps. Extra leather layer on elbows and shoulders. Metal breathers under arms. Adjusters on cuffs and neck. Belt with buckle protector. It is available in no less than three different colour options. The Freddy takes its inspiration from post-war leather flying jackets. But whether you’re aware of this or not, what we like about the Freddy is that it just looks like a leather jacket you might buy on the high street. The premium grade cowhide is incredibly soft and supple. For even more abrasion resistance, the jacket has an anti-abrasion lining. Armour comes courtesy of D3O, and is fitted in the elbows and shoulders. There’s a pocket for a back protector should you want one. For colder days, there’s a removable padded thermal jacket. You get loads of pockets inside and out. The cuffs on the hem and sleeves are made from a knitted rib. The Hawker is made from buffalo leather which, naturally, has an age-worn patina. There’s a lightweight removable thermal inner that will take the chill off a cool morning. D3O armour comes as standard in the elbows, shoulders and back. You get accordion stretch panels in the elbows, adjusters at the waist, and cuffs that close by popper and zip. As ever with Richa, you get a lot for your money. 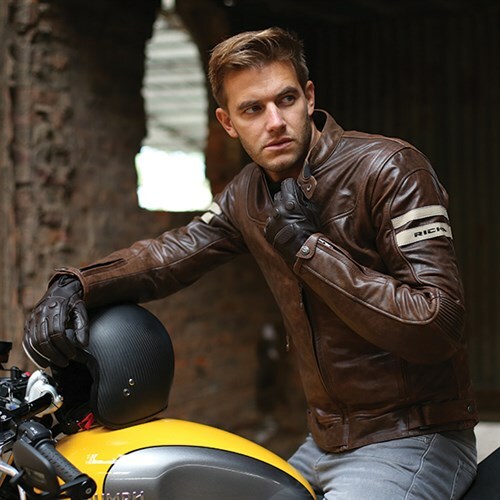 This is not your average leather biking jacket. The jacket that is available exclusively as a bespoke piece by Brian Sansom of BKS. 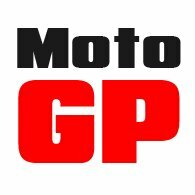 Basically, you make an appointment to meet with Brian on one of his regular visits to Motolegends in Guildford. He’ll take a whole raft of measurements to make this a jacket that fits perfectly, and that fits you alone, and not just the average guy with your chest measurement. 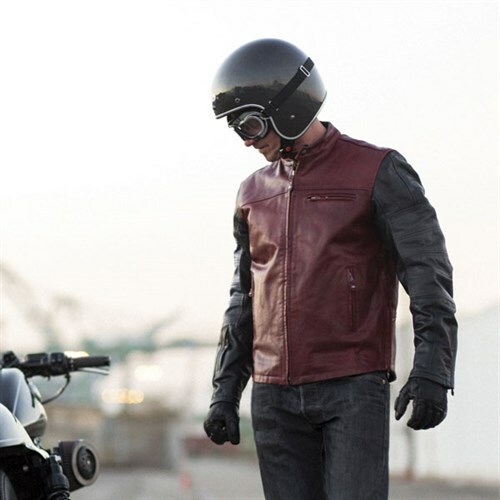 He’ll also talk you through dozens of options in terms of different leathers, zips, pockets, linings and trim. Every biker has collected over the years a selection of jackets. Often these have been discarded because they don’t fit quite right. A BKS Café Racer from Brian will fit right. Prices start at £1,250. We like the Icon brand. It’s different, and they do the ‘streetfighter’ look better than anybody. Their gear is normally hugely over engineered, making it perfect for a post-apocalyptic world where survival is everything. 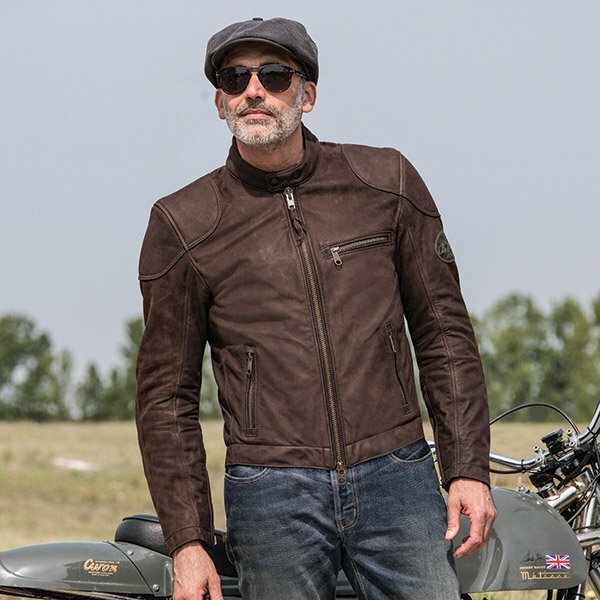 But when we saw this jacket in the flesh for the first time, we thought it was fantastic, with a leather that was for more supple and comfortable than we had imagined it would be. 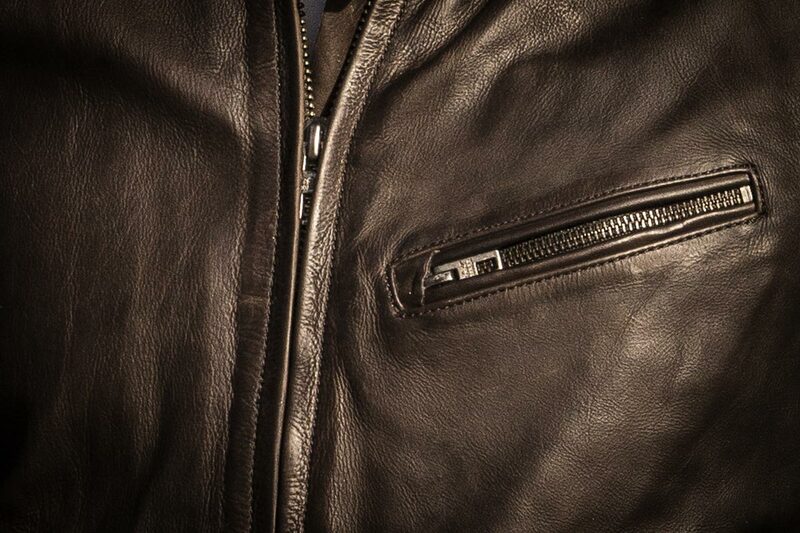 The leather is 1.1mm to 1.3 in thickness, and it comes in a finish that Icon would term ’battle-worn’. There’s D3O armour in the shoulders, elbows and back, and you get a removable thermal liner. 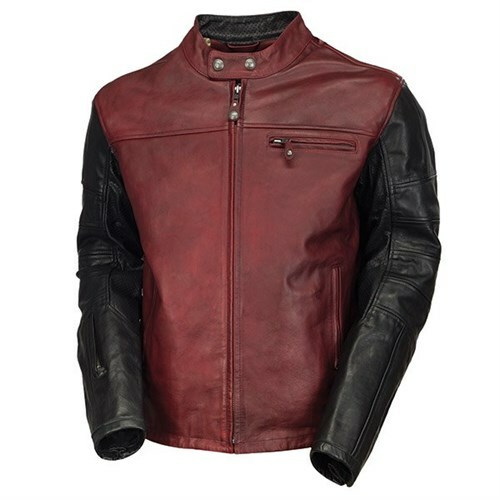 The leather has quilted detailing on the shoulders, and perforations under the arms. For ease of movement, there’s leather accordion panelling in the shoulders. To show these guys are serious about making a top-quality jacket, the zips are by YKK. It’s a proper bit of kit, and very tough. Café-racer styling. Hand oiled and waxed top grain cow hide (1.1mm). Pre-curved sleeves. Dropped back. Perforated leather trims. Zipped waist adjuster. Pockets for optional Forcefield Or D30 shoulder, elbow and back protectors. You may or may not know that we are working closely with the UK distributor to help him sell through his stock, in anticipation of new distribution arrangements. This explains why we can offer a current RSD leather jacket at 30% below its recommended retail price. 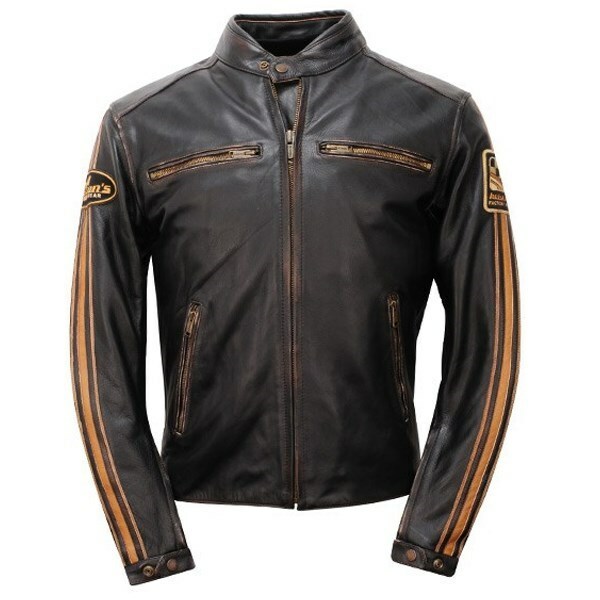 Click here for details of other Roland Sands jackets that are similarly reduced.